With its interactive Virtual Promoter, AMERIA digitizes shop windows and brick-and-mortar stores and excites customers. AMERIA is an established technology company, which develops digital marketing and sales solutions for companies like HARIBO, MediaSaturn and Porsche. Its flagship product, "Virtual Promoter", the interactive solution for shop windows and brick-and-mortar stores, revolutionizes the shopping experience across the globe. In this sector, revenue grew by 124% in Q1/2017 compared to Q1/2016. AMERIA and Mackevision’s joint press event was well received by the national daily and industry press. We are pleased to provide you with our pitch deck, which summarizes AMERIA`s business model and strategy and illustrates our company’s potential. As always, you can find all information on us, our team, and AMERIA in our company profile. Please click on the picture above to open the pitch deck of AMERIA. Retail is changing. Both traditional local retailers and service providers, such as banks, are finding themselves in stiff competition with offers on the internet. At the same time, the majority of sales still take place at the physical Point of Sale: currently over 90%. According to numerous studies, this will remain the case in the future. Not least because of this, eCommerce providers from Amazon to Zalando are opening their own shops. But success in the brick-and-mortar world is only possible if shops, branches and showrooms change. Retailers must address their customers in a new way. This heavily depends on the use of technologies, which create new experiences and connect the offline and online worlds. All industries need support with digital transformation. With software, hardware, content and service, AMERIA provides complete solutions for digitization in six industries. The starting point is AMERIA’s flagship: Virtual Promoter, the interactive solution that appeals to customers and can be controlled via simple gestures. Both in the shop window and in the shop itself, Virtual Promoter offers users exactly what they expect from the physical retail: a great shopping experience and information. Our first crowd investing campaign ran from February to June 2016. The success was overwhelming. 1281 Companists gave us their trust and invested 1.1 million Euro meaning that we were able to reach our financing limit even before the campaign ended. Beginning with the digitization if the shop window, we now have expanded to the sales floor, the inside of branches and showrooms. 2016 was characterized by a series of tests and pilots, including the Porsche Center in Dubai and in various branches of the consumer electronics chain, Saturn. Based on this, the first large-scale rollouts of Virtual Promoter and the associated technologies are in planning for 2017. Accordingly, it may not come as a surprise that our customers are very satisfied with AMERIA’s services and are counting on our future support in all areas of digitization. How did we use the funds from the first campaign? We used the capital of 1.1 million EUR from the first round of crowd investing primarily in the areas of marketing, product development and patents/certifications. The fundamental optimization of our brand identity is a decisive factor in the perception of AMERIA as the provider for surprising and exciting customer experiences. Our customers are all large corporations; a presentation that creates confidence is therefore crucial. In the product development process, we concentrated on the expansion of the offer for the digitization of the in-store experience. This way, we were able to acquire a great many new customers in industries in which the shop window plays less of a role. Why another crowd investing campaign? In order to continue the positive development of AMERIA and to achieve a faster rate of growth, there is need for further investments. We especially want to expand our team in the areas of product development and for the implementation of pending large orders. To this end, we have decided to go for crowd investing: We very much appreciate the current cooperation with the Companisto and many Companists. We received a lot of valuable feedback from the market and new ideas are coming in constantly, e.g. for our product development. A further round of financing will also help us to avoid larger external investors. In turn, this means we can we can keep the slim decision-making structure that is necessary for high-speed innovation. Last but not least: since the conclusion of the first campaign, many requests from Companists have reached us, asking for a new chance to invest. The second campaign offers the perfect opportunity for this. From its beginnings as a software developer, AMERIA has developed a broad product portfolio adapted to meet the needs of various different industries. Both with our flagship product, Virtual Promoter, and with other technologies we are driving the digitization of shops, branches and showrooms. 1. How does Virtual Promoter work? The first step was the digitization of the shop window with Virtual Promoter. Passers-by are recognized and addressed by a life-sized promoter or avatar. By using simple gestures, they can then navigate through content, play games or retrieve information about different products. AMERIA has created an ecosystem around Virtual Promoter, which renders the operation scalable. All installations are controlled centrally via the cloud, content can be created and exchanged there and partnerships for installation and service allow global use. The result: a significant increase in attention, traffic, and sales. Business Model 1 is intended for industries in which manufacturers and service providers operate their own space, e.g. automotive and finance. AMERIA provides individual, full solutions including software, hardware, content and service. Scalability results from the high number of branches and sales locations worldwide. In the next step, the business in these industries will be licensed out to individual industry partners. For the healthcare industry, AMERIA is already working on a partnership with the long-term client and globally active agency inVentiv Health. In the financial sector, AMERIA and Diebold Nixdorf are already closely cooperating in projects. In the areas of consumer electronics and FMCG/toys, brand manufacturers are largely dependent on retailers. As a result, they are investing in the innovative presentation of their products in brick-and-mortar stores. Marketing budgets are increasingly being used to this end. The challenge of digitization of the physical space lies in the need to connect software, hardware, content and sustainable operations. With the software and hardware product portfolio, AMERIA provides scalable solutions that are tailored to the needs of different industries. With Virtual Promoter, AMERIA offers a unique and patented instrument for creating attention for businesses and products, which is proven to increase traffic and sales. Virtual Promoter connects the physical to the online world. With the ecosystem developed by AMERIA, scalability and global applicability are ensured. All of the solutions are operated via proprietary cloud software. This means that all tasks, such as operating the physical installations, development and distribution of content, the collection and analysis of data and the connection to existing systems such as customer databases are centralized. AMERIA works for clients from six different industries. Virtual Promoter stands at the very center as the entry point into digitization and the gateway to the digital world at the physical Point of Sale. The number of clients with whom AMERIA actively works, has multiplied in 2016. 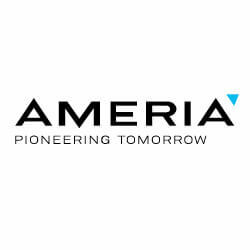 “With the Virtual Promoter solution, AMERIA has proven itself to be a force for innovation and has managed to implement the digital transformation in a customer-focused fashion. With their forward-thinking scenario on Azure, Ameria is an important and strategic IoT partner for Microsoft." “Two thirds of the leads on the Microsoft booth at EuroCIS 2016 were generated through Virtual Promoter". Only with strong partners can AMERIA become the worldwide default provider for the digitization of physical retail. Diebold Nixdorf has been AMERIA’s service partner since 2015. This is how we ensure the smooth operation of our solutions worldwide. Since 2016, we have also been working closely with Diebold Nixdorf in sales, especially in the financial sector. In Germany, AMERIA cooperates with the CEMA AG from Mannheim, who provide logistics and service. In 2016, our exclusive partner for the Czech Republic and Slovakia, ppm factum, has already implemented several projects with Virtual Promoter. Our German distribution partner, i42, has realized its first sales of Virtual Promoter. AMERIA is currently looking to acquire partners for all six industries. In the healthcare industry, the cooperation with our client, the globally-active agency, inVentiv Health, is now materializing. The first project has already been successfully sold. AMERIA operates in two markets: digital out-of-home advertising (DOOH) and solutions for the digitization of physical retail. The market for DOOH advertising, with a volume of EUR 35.5 billion in 2017, is projected grow strongly over the next few years. The growth is mainly driven by digital DOOH advertising, which together with interactive advertising is increasingly replacing analog and passive forms of advertising. Marketing budgets are being moved from other channels such as print, radio, TV, online and mobile into new channels, such as the Virtual Promoter interactive advertising platform. In 2016 there were more than 100,000 screens for DOOH advertising in Germany alone, more than two thirds of them in placed in retail. Our calculations show that there is a potential for at least 5,000 Virtual Promoter screens around the world by 2024. At a conservative estimate for the turnover of EUR 2,500 per screen/month, this results in a total turnover of over EUR 120m. In 2016, we successfully tested our solutions in several industries and developed a precise understanding of the specific needs and challenges involved. In the next step, solutions for different industries will be implemented in larger rollouts. The new business model “Virtual Promoter Advertising Platform” was tested last year in consumer electronics retail. Implementation in a major and lasting framework is scheduled for September 2017. In the FMCG space, the platform will be tested in 2017, both in department stores and in supermarkets. With Virtual Promoter Window and Virtual Promoter INCA, we now have mature products that can be used at low costs. The next steps in product development will lead in two directions: on the one hand, we will be developing our cloud software, my.virtualpromoter.com, which has thus far supports the creation and distribution of content as well as the management and control of installations, into the AMERIA POS Marketing & Sales Suite. This will enable our clients to connect different physical and mobile solutions, to analyze data and integrate existing systems. How Will You Use the new Crowdfunding Capital? Usage of the funds will be concentrated primarily in two areas: implementation of our interactive advertising platform for retail in the consumer electronics and FMCG/toys industries and implementation of major orders in other industries. AMERIA could finance both of these from turnover, but would lose the advantage of speed and possibly thereby the edge over the competition. In the medium term, we are therefore planning to raise up to EUR 1.1m additional to what we are looking for from Companists. ► With EUR 300,000, we plan to pre-finance 50-80 Virtual Promoters for the development of the interactive trade advertising platform. ► With EUR 600,000, we additionally plan to expand personnel in the areas of service, sales and software development. ► With EUR 1m, we additionally plan to prepare targeted internationalization, including the submission of new software patents in the USA, certifications and further trademarks and industrial designs in both the EU and the USA. ► With EUR 1.4m, we additionally plan to develop a user-friendly auction platform for advertising time on the interactive Virtual Promoter advertising platform. In 2016, Thomas Thomas Steckenborn, CEO of CEMA, AG invested in AMERIA. The EUR 800,000 announced in the first campaign became EUR 1m. Since then, the cooperation between AMERIA and CEMA has intensified in various areas. This will be crucial in the operation of the advertising platform. Furthermore, an existing investor increased their investment by a further five-digit amount at the new evaluation.